Close to 12,000 people poured into the Grande 21 Arena last weekend after snow that blanketed the area Friday began to melt and the sun burst forth. 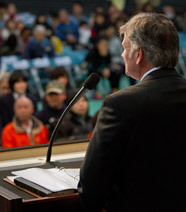 Nearly 900 others watched from satellite locations elsewhere in Japan. More than 400 people made commitments to Jesus over three days.